What does the think tank landscape look like in Armenia? First of all, the term itself remains an alien catchword that has not taken root (and, frankly, perhaps it should not). Translated into Armenian (ուղեղաին կենտրոն) it sounds utterly ridiculous. Of the 11 Armenian think tanks mentioned by name in the Global Go Think Tanks Index Report 2014, in fact, only one describes itself as a think tank (in English, but not in Armenian). Some organizations prefer to call themselves research centers: a name that is easily translatable into Armenian. Others have broader descriptions corresponding to their general mandate (“an academic bridge between diaspora [sic] and native Armenian scholars” or a “non-governmental organization … which aims to assist and promote the establishment of a free and democratic society in Armenia”). Taking a closer look at those 11 organizations (supposedly the top Armenian think tanks as ranked by external reviewers) is an interesting reality check. As the 21st century saying goes: if you are not online, you don’t exist. How do these 11 names fare in a Google search? The table below summarizes the results. As a result of my little Googling exercise, one organization (Education and Training Unit) could not be found at all and another two are only mentioned on other organizations’ web sites but have no web sites of their own. Either they were active once upon a time, resulting in their names being listed in some databases, or they are very internet-unfriendly think tanks that prefer not to maintain their own web sites. (Let me clarify that at this point it is not my intention to engage in a discussion on how accurate the Global Go Think Tanks Rankings are, although this small experiment could be a starting point for such a debate. This was simply an empirical approach at trying to gauge the internet visibility of “top” Armenian think tanks). Of the remaining eight organizations, two have not updated their websites since 2013. We are left with only six “finalists” that seem to be up and running. For those studying Armenian civil society this is no surprise. Many organizations in this sector are short lived or exist only on paper. Who are the main consumers of those research centers’ outputs? 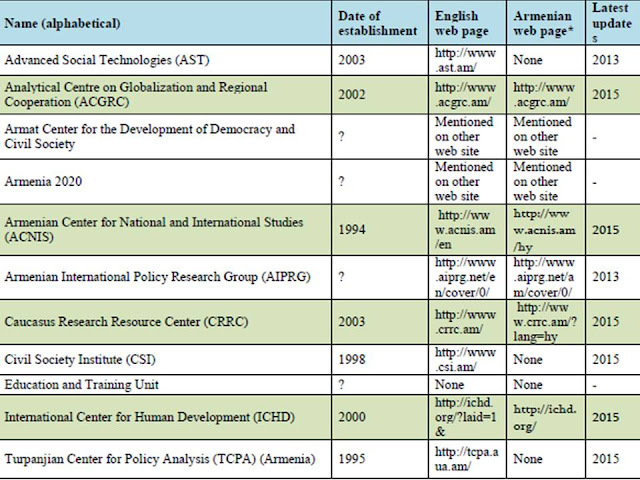 Note that two of the six “finalists” (including the research center I work for) have no Armenian websites. This does not mean we do not produce Armenian language reports or policy briefs (we do), but it does tell you something about the main focus. Another interesting little experiment: of these four organizations that maintain both English and Armenian websites, if you just type in the ‘main’ website (like www.acgrc.am for our first example) it will take you to the English version in three cases; only in one case (http://ichd.org/) the first page you land on is the Armenian page. English language seems to be more important. This is no big surprise if you think where the main sources of funding are, but it does raise a question of how relevant think tanks are (and want to be) to the population of their own country. One might argue that this is not a problem. Think tanks’ main “clients” are decision-makers. In the case of Armenia it should be the Armenian government and the international development organizations. Both turn to think tanks from time to time, but the outputs are produced for internal consumption, making it hard for the think tanks to establish themselves in the public eye, and to improve the quality of their products, as there is no equivalent of peer-review. As a result, Armenian think tanks remain virtually unknown to the public, including such important segments of the public as journalists, students, scholars, and others who would clearly benefit from think tank generated, systematized and stored information. But is there a public interest in research and analysis produced by think tanks? Here is another little experiment: Civilnet (currently one of the leading sources of online news in Armenia) has about 30 articles in Armenian discussing research conducted by Armenian organizations or individuals: a simple search for the Armenian word հետազոտություն (research) returned 156 hits, out of which approximately every 5th was about research conducted locally. So, yes, there is some interest, and there are news outlets willing to publish think tanks’ stories. Of course researchers have to make an effort to translate their outputs into media- and public-friendly language (and of course, it wouldn’t hurt if it was also translated into Armenian). While some Armenian think tanks are well established, there are many organizations (claiming to be think tanks) that are short-lived or active only from time to time. Their activity is mostly driven by external funding. They tailor their outputs more towards English readers. As a result, their public outreach and impact remains very low. 1. Does Armenian public need to know more about the think tanks? Should think tanks prioritize public outreach more, or should they use their scarce resources to target donors and top decision-makers? 2. Do donors have a responsibility to share think tank outputs with the public in a language accessible to the public? 3. How can we ensure the quality of Armenian language outputs, given that the circle of potential peer-reviewers is so small? While these questions are beyond the scope of this post and are not likely to have simple answers, they are worth deliberating. What’s your take on these issues? Share your insights by tweeting at us here.